The Nokia 8 is here at last - but is it the flagship smartphone from the iconic brand we were expecting? Only time will tell, but it's safe to say, from our initial impressions, the Nokia 8 is a very solid device and has all the trademarks of a 2017 high-end phone including a few little neat tricks up its sleeve. But before we dive into the new device, let's start with a little history. 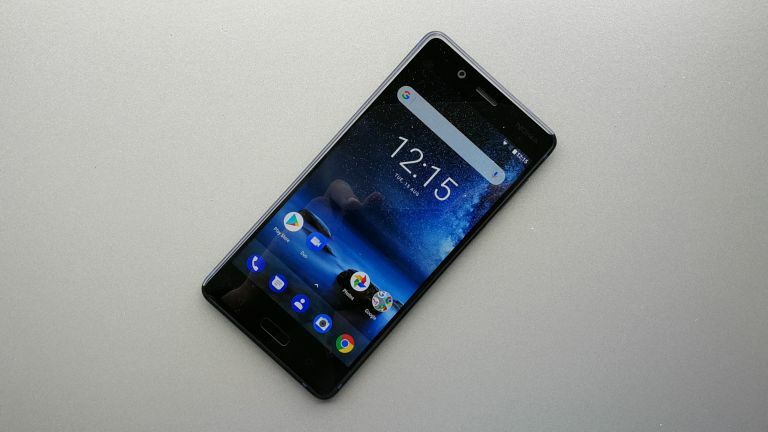 The Nokia brand was relaunched by HMD Global at MWC this year, initially with a budget and mid-range offering, including the Nokia 3, 5, and 6. These phones run Android, and have nothing to do with the old Lumia range of Windows phones. The Nokia 8 is the brand's new range-topping model, coming in at €599 (around £550) it's also the most expensive. For that cash, you'll get specs which match the flagships from Samsung et al. Including the Qualcomm Snapdragon 835 chipset, 4GB RAM, 64GB expandable storage and a 5.3-inch QuadHD display. It even features a full-length graphite shielded copper cooling pipe that dissipates the heat. From our initial play with the Nokia 8, it felt very quick, which is what you'd expect as it's essentially the same set up inside most other flagship phones. The LCD screen left us very impressed, it's sharp, and vibrant (so much so at first, we mistook it for an OLED panel). So far, so good. The design is also very solid. At 7.9mm thick it's not the sleekest handset out there, but that makes it very comfortable to hold, with ergonomic tapered edges and soft corners. It's well proportioned, but doesn't feature the bezel-less display found in the Samsung Galaxy S8, LG G6, and upcoming iPhone 8. Obviously, it's not the only phone to not include this new display tech (HTC U11), but it does make it look slightly more dated than the others. It even comes in a striking Polished Copper, as well as other polished and matt finishes. It's particularly smart of Nokia to let customers choose between matt and polished finishes - we like that a lot - because while the polished finish looks more striking, the matt finishes offer more grip. It's a tough choice, but good to let consumers make that decision. And now we arrive on the things that actually make the Nokia 8 a flagship phone. You see, it's now 2017, so to be considered a true flagship you need to be the best at something, or offer something others can't (Sony XZ Premium's super slow motion recording, Samsung's screen, Pixel's camera and software). For Nokia these little bits of magic include OZO audio recording and a 'bothie' camera. Let's start with OZO Audio, shall we? The 8 combines three microphones to Nokia's acoustic algorithms to capture 360-degree spacial surround sound. This can be used in conjunction with 4K video recording, to create more immersive videos. It's also smart enough to use binaural codecs, which enable high fidelity playback on devices without OZO Audio. It's a cool idea in theory, and you'll have to wait for our full review to see if it works in practice. Personally, I can't remember the last time I recorded a video on my phone, and when I did, it would have been something spectacularly dull, which wouldn't benefit from awesome 360-degree audio quality. What I'm saying is this feature is unlikely to sell phones, but it'll be a nice benefit for people who do decide to buy the Nokia 8 and film lots of video using their smartphone. The next innovation is the 'bothie', an evolution of the selfie (I really had to force myself to type that). This uses the front and rear facing camera to create an image showing two sides of the story. It's a cool idea and very well executed, but the 'bothie' branding does make us cringe a little. The camera set up on the Nokia 8 is actually pretty cool. The rear facing dual camera features one colour stabilised sensor and one monochrome sensor, similar to the Huawei P10 set up. These, combined with the front facing camera, are all co-developed with Zeiss optics. They all use a 13MP sensor, so image quality is the same in both directions. We'll let you know what the image quality is like in our full review. We're looking forward to testing it further, to see whether it's software, camera and battery perform as well as we hope.